Svoufossen (Svøufossen or Svøufallet) was the first of the three major waterfalls we saw converging on the community of Åmotan (apparently meaning “converging of the rivers”). 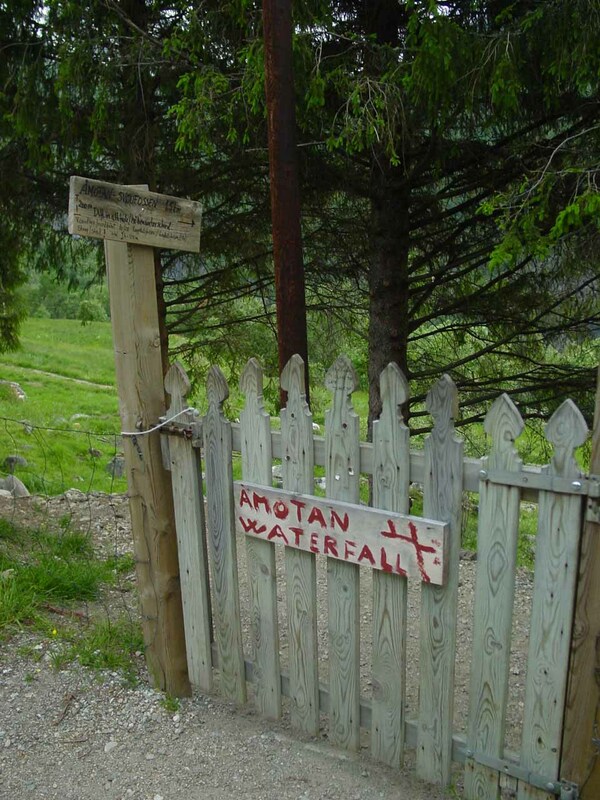 Julie and I initially saw this waterfall from its top after making a wrong turn. But once we finally got to the right place at the Jenstad Farm, that was when I went on a well-signed short downhill walk around and through the Jenstad Farm until I finally got the clean view you see in the photo above. It was said to have a 156m freefall with a cumulative drop of 313m if you count all the sloping cascades before and after the main drop. 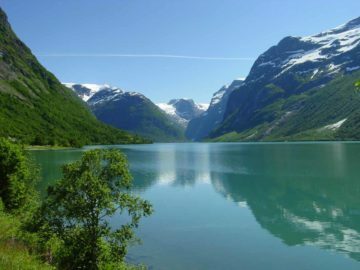 Given the volume of the Grødøla, which itself was sourced by numerous large lakes (Storvatnet, Koksvikvatnet, Svartsnytvatnet, Klokkavatnet, etc.) 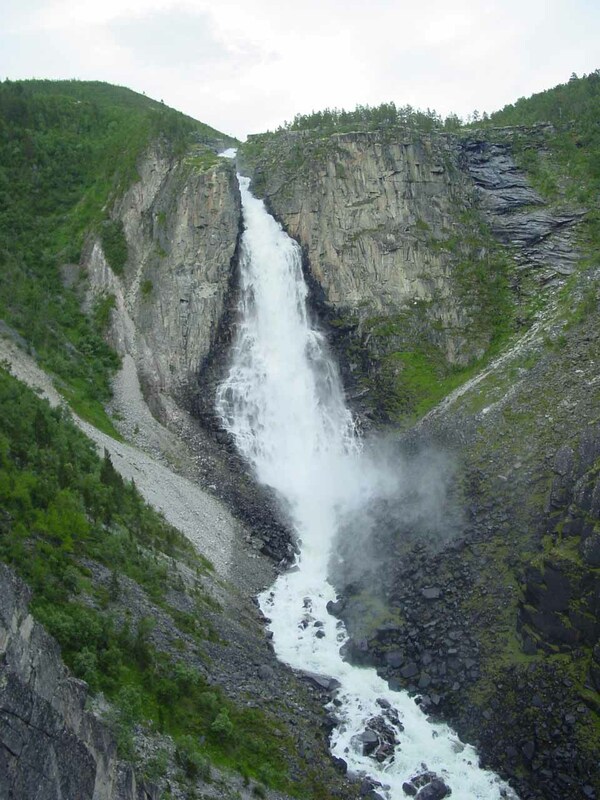 further upstream, Svøufossen flowed with impressive volume even as it twisted during its vertical plunge. 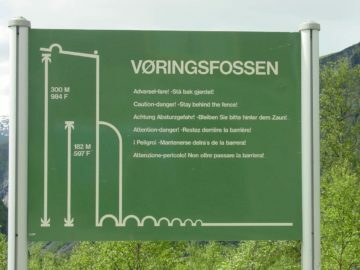 We stopped at the second of the handwritten signposted car park (toll required; see directions below), then I followed more handwritten signs pointing the way to Svøufossen. 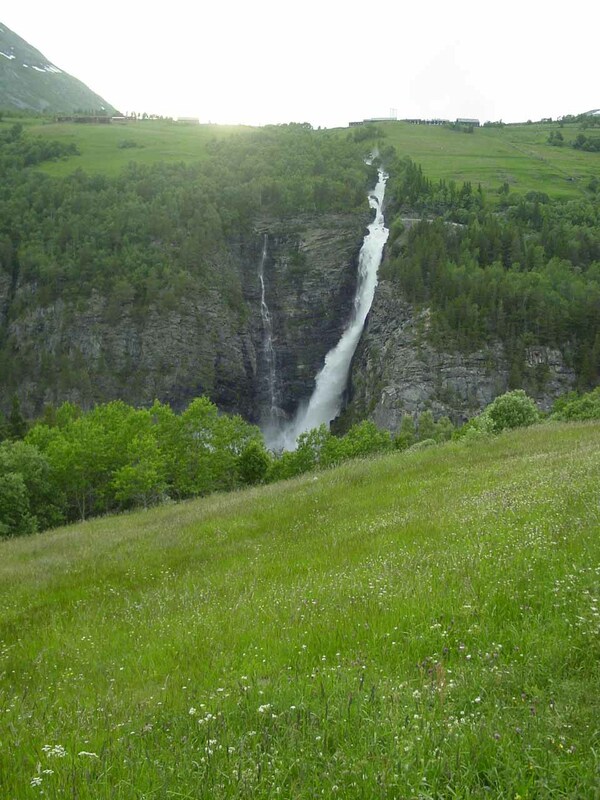 Immediately from the car park and in the early portions of the trail through a grassy pasture, I also got clean looks at the sloping and twisting cascade called Reppdalsfossen (or Reppfossen or Reppfallet). 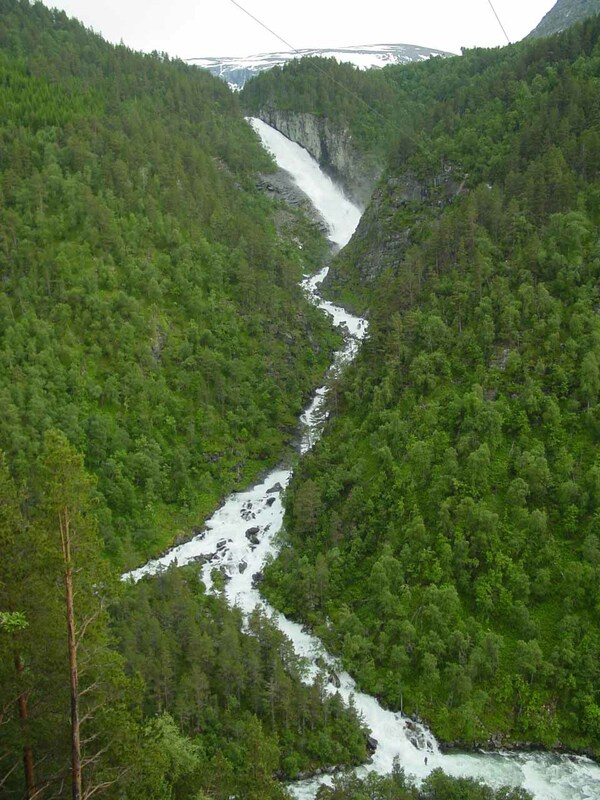 This 180m tall waterfall also had impressive volume on the river Grøvu (another one of the rivers converging on Åmotan). 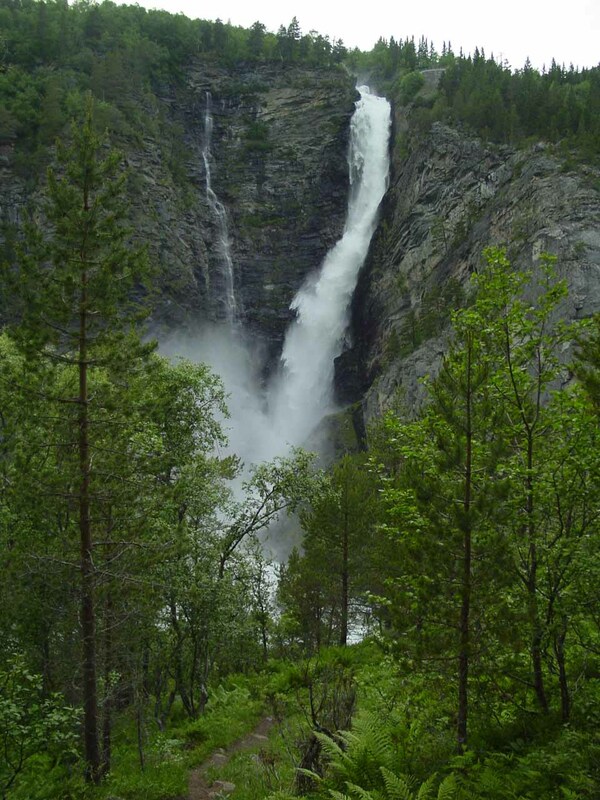 This was the second of the three major waterfalls I encountered (Julie saw it, too, from the car) during our brief stint in Åmotan. 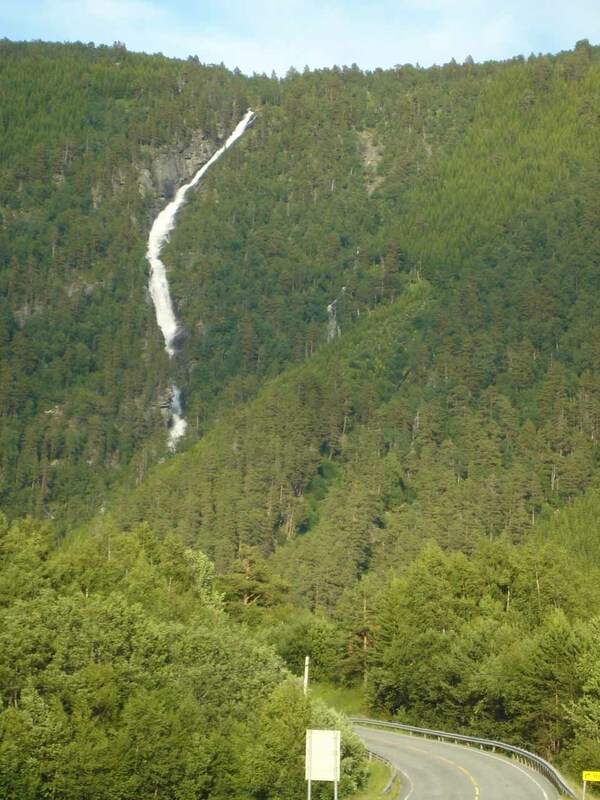 I wouldn’t get close to it, but the views I was able to get from the Svøufossen trail were good enough. 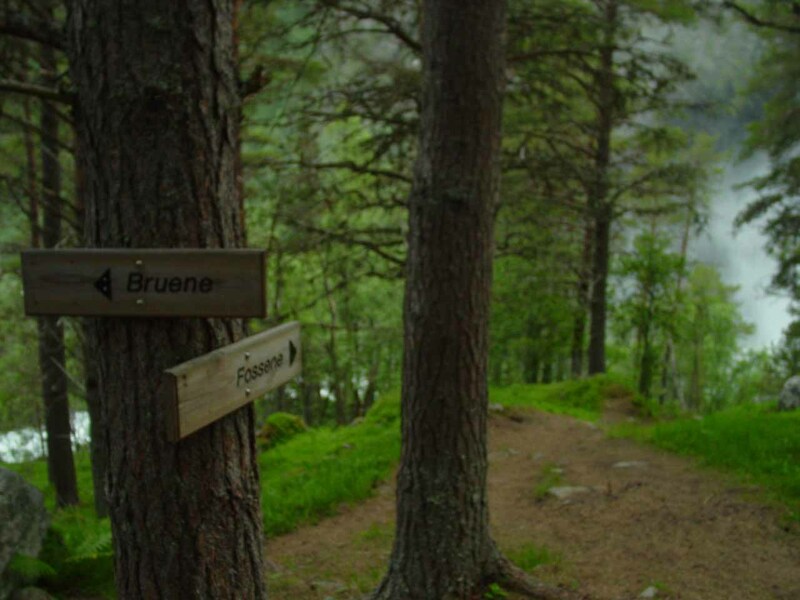 Anyhow, after passing through the pastures, the signs on the trail pointed me to continue onto a steeply descending section as it entered into a forest. 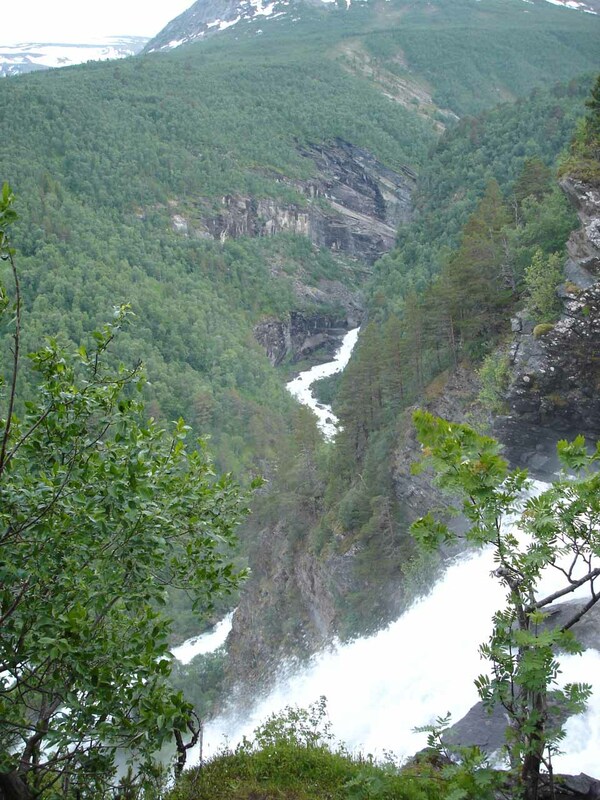 The steep forested hill I was on didn’t last for long as it was only a couple of minutes before I got the clean look at Svoufossen that you see at the top of this page. That said, with all the descending to get down here, it was a bit of a sweaty and tiring climb back up to the car park given the somewhat steep nature of the terrain. 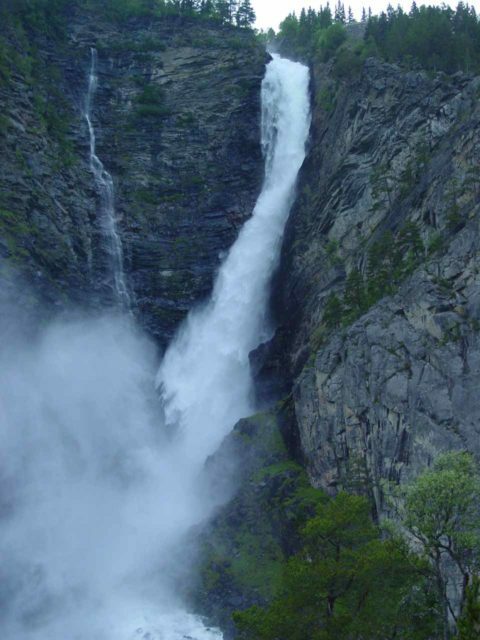 After about 20 minutes away from the car, I rejoined Julie who was waiting at the car so that should give you an idea of how quick this short hike and scramble was to see both Svoufossen and Reppdalsfossen. 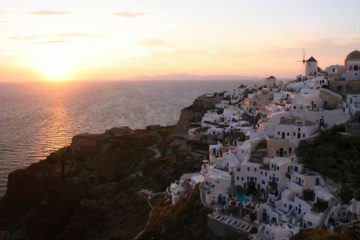 The adventure didn’t end there, however. 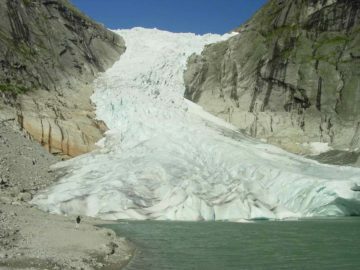 Less than five minutes later, we then quickly drove to the other car park (also toll required), which was the trailhead for Linndalsfossen, which I made a separate write-up for since this one involved a bit of a longer hike. 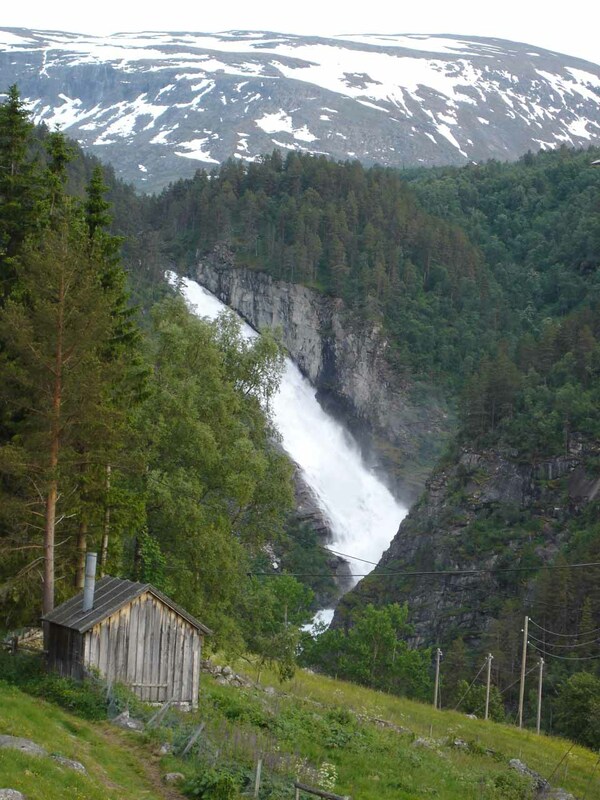 Svoufossen and Reppdalsfossen reside in the Sunndal Municipality. For information or inquiries about the area as well as current conditions, visit their website or Facebook page. 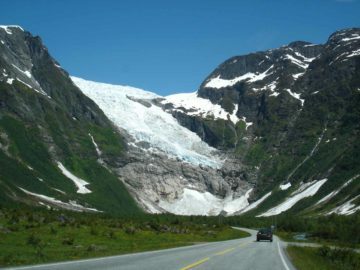 To get to Åmotan, we drove east on Rv70 about 33km from Sunndalsøra (this drive was described in our Vinnufossen page). 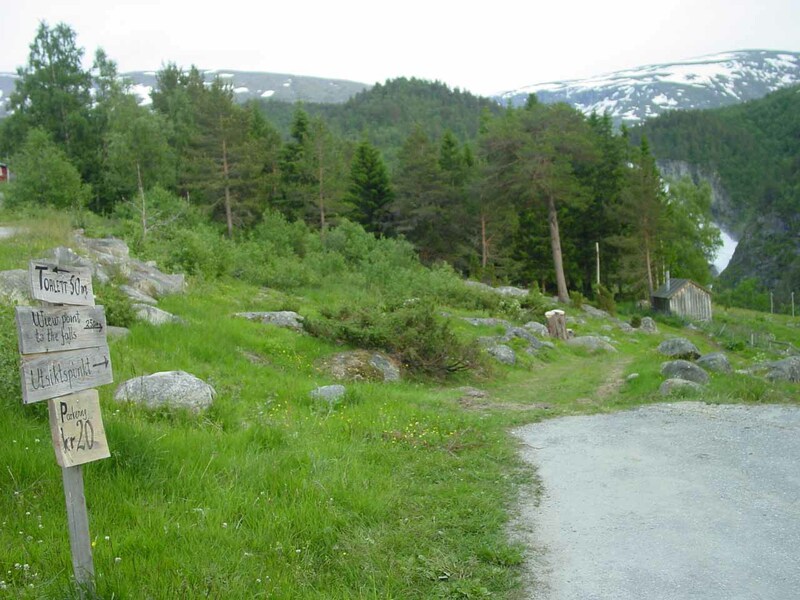 We then turned off Rv70 onto a county road (Fjellgardsvegen; “Mountain Farm Road”) near the community of Gjøra. At about 3.5-4km from Rv70 on the county road, we encountered a fork. The right fork crossed a bridge and ultimately led up to the hamlet of Fjellgardan and the valley of Svisdalen. The left fork, which was the one we would ultimately want to take, led to the Jenstad Farm. About 2km up this local road was the first car park we saw. 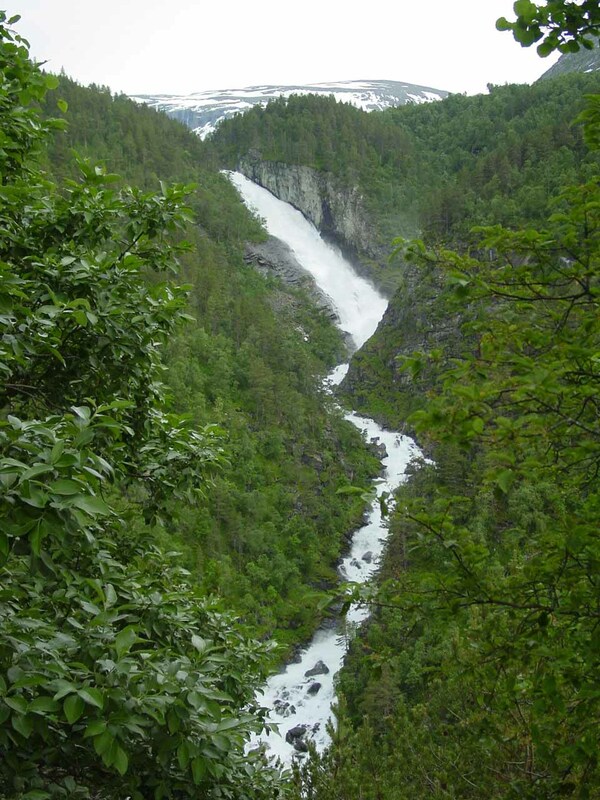 Even though we could have gone through a fence and hike downhill towards Svoufossen from this spot (as well as go to Linndalsfossen), we actually continued driving another 200m to the next car park. 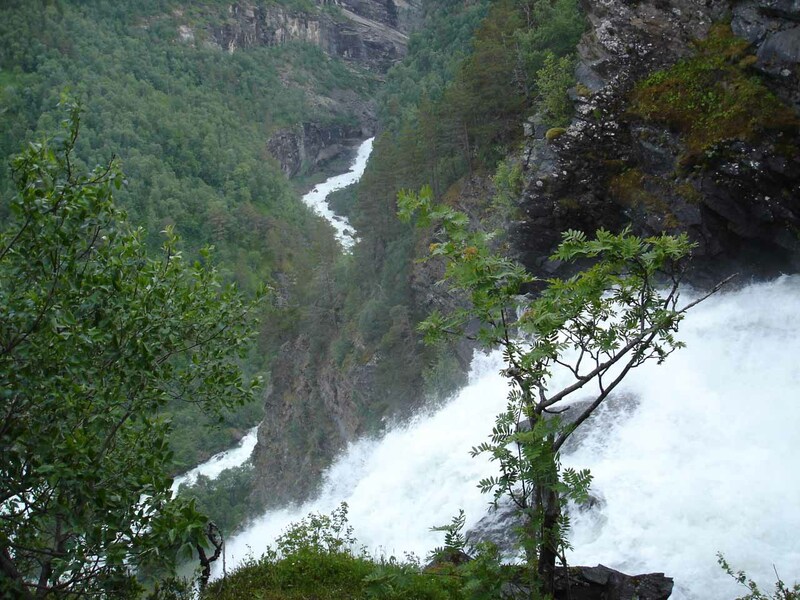 It was from this second car park that we were able to see Reppdalsfossen as well as do the walk to Svøufossen as described above. 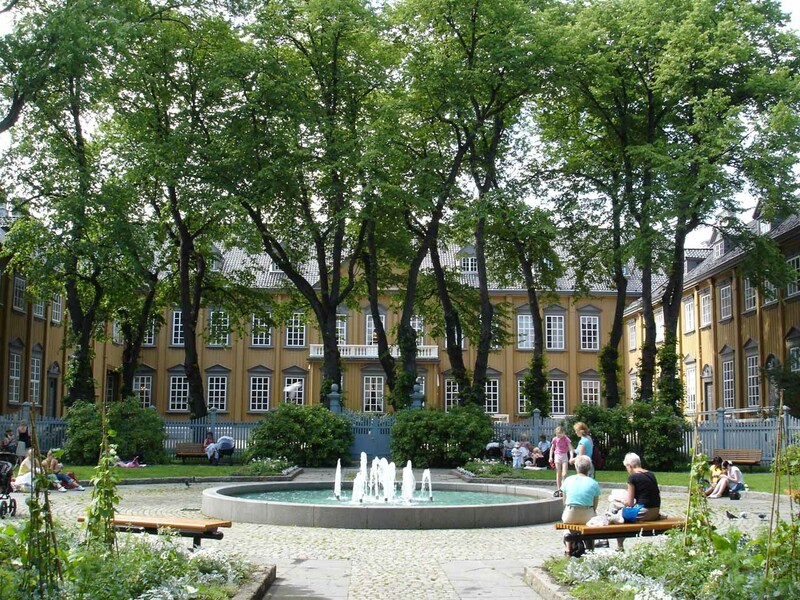 The parking toll for both car parks was 20 Norwegian Kroner (around $3 USD as of July 2005). 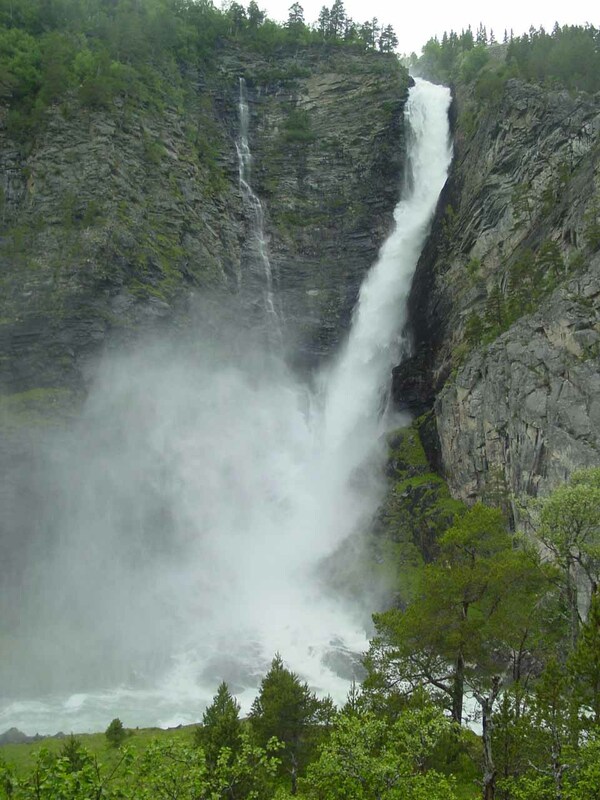 By the way, I mentioned earlier that we also saw Svoufossen from its top. We managed to do this accidentally by going straight at the fork mentioned above instead of going left. 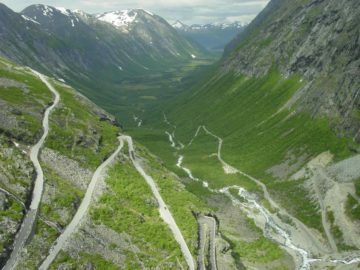 So we crossed the bridge over Grøvu, then drove another 2.2km to the first switchback as the narrow road started to climb steeply (apparently the road was called Snøgutu, or “Snow Road”). It was from this switchback that we looked down at the falls and realized that we probably weren’t going the right way. 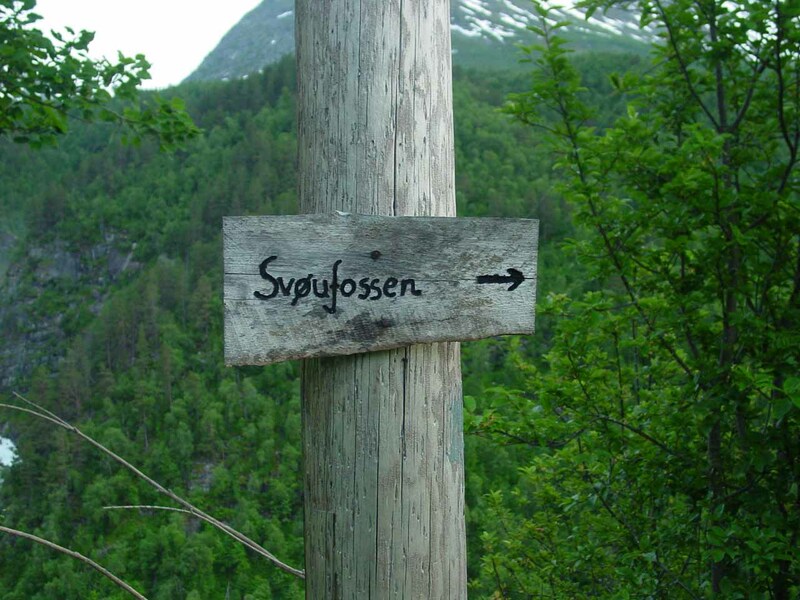 So we turned back to go to the Jenstad Farm, and we never made it all the way up to Fjellgardan.